Peel and core each apple. Chop into 1-2 inch pieces. Place in a medium saucepan. Add water, syrup, and brown sugar. Bring to a boil, then reduce to a simmer. 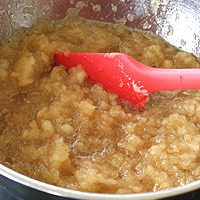 Cover and simmer 10 minutes or until apples are softened. 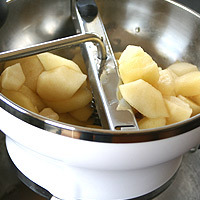 I like to chop the apples small because they cook faster and are easier to process. Process using one of the following methods (a food mill gives the best taste and texture). food mill (preferred)- Use the largest disc of a food mill and process the mixture. 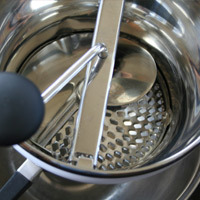 potato masher (second best)- Mash with a potato masher to desired consistency. food processor- Add to the processor. Work in batches for a consistent texture. Stir in salt and cinnamon. A food mill is great to make an even consistency. It also brings out the flavor of the food more than a food processor will. It is more work, but worth it for taste and texture. 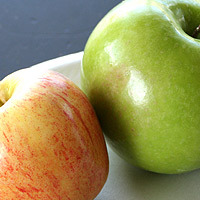 Water content- not all apples are the same even when buying gala or granny smith. This can throw the water and sugar content off. Weighing the apples will bring the most consistent results. watery sauce- boil down after processing but before adding the salt and cinnamon. 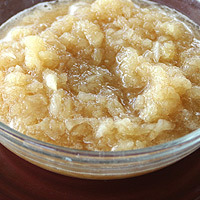 too sweet- add another granny smith apple and 1-3 T water. 1. Peel and core each apple. Chop into (1)1-2 inch pieces. Place in a medium saucepan. Add water, syrup, and brown sugar. Bring to a boil, then reduce to a simmer. 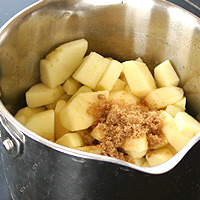 Cover and simmer 10 minutes or until apples are softened. food mill (preferred)- Use the largest disc of a food mill and process the mixture. food processor- Add to the processor. Work in batches for a consistent texture. 3. Stir in salt and cinnamon. Serve warm, cold, or at room temperature. 1. 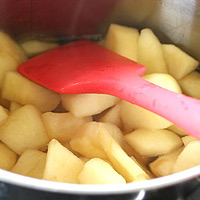 I like to chop the apples small because they cook faster and are easier to process. 2. A food mill is great to make an even consistency. It also brings out the flavor of the food more than a food processor will. It is more work, but worth it for taste and texture.